At the Fate of the Furious premiere on Saturday night, both Dwayne 'The Rock' Johnson and Vin Diesel seemed keen to put their rumored beef behind them. ET's Kevin Frazier caught up with the two stars separately on the red carpet, where Johnson said focusing on making a great movie for the fans helped him keep perspective. "Then I think all of the other stuff kind of just has a way of working itself out," he said. Johnson explained why he never minced words about the reported feud, which made headlines when he shared an angry Instagram last August, slamming his male co-stars. Dwayne 'The Rock' Johnson during WrestleMania XXVII at Georgia Dome on April 3, 2011 in Atlanta, Georgia. WWE Superstar and actor, Dwayne "The Rock" Johnson speaks to the media before Wrestlemania 28 in Miami, FL. "Just like, in life, you have different philosophies and people have different fundamental philosophies on how you do things," he added. "And again, the most important thing is just the movie. So I'm happy that we're here in New York City, I'm happy the fans love it." 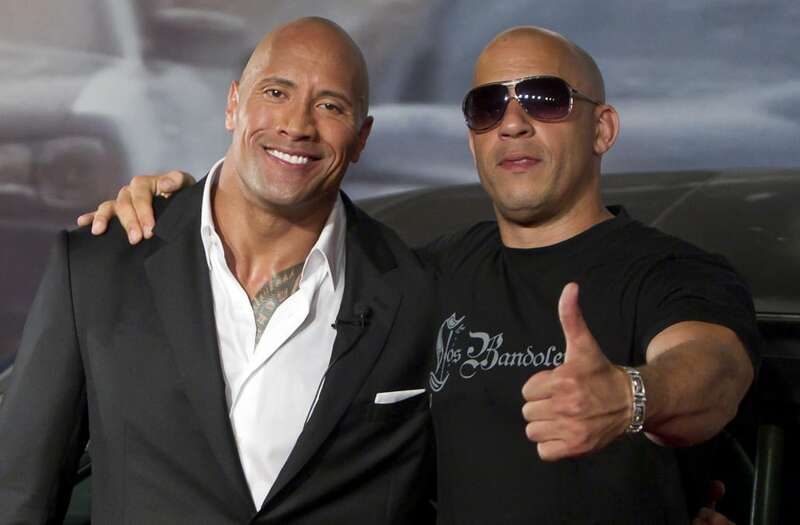 Diesel, who -- apart from playing the role of Dominic Toretto -- is also a producer on the Furious franchise, tells ET that despite the appearance of beef, he and Johnson are still close: "In my house, he's 'Uncle Dwayne,' and I'm proud of that," the 49-year-old actor says. "We still love each other, that's my boy," Diesel says of his costar. "When I was making that difficult decision, should there be an 8 or not, I called [Johnson] and he said, 'Brother, I will be there shoulder to shoulder with you to make sure it's the best movie in history.' And he delivered." Speaking on the scale of the high octane action and the tight time-frame of the shoot, Diesel says the ambitiousness of the project added to the difficulty of filming the first installment without Paul Walker. "I'm still reeling from the loss, the idea of continuing along without my brother Pablo and what that felt like and the complexities of that," says Diesel. "But that's all filmmaking you know?" The Fate of the Furious opens in theaters on April 14. Go behind the scenes on some of craziest stunts in the action-packed franchise in the video below.